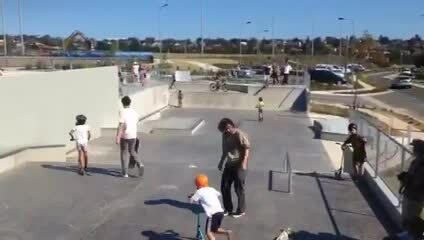 Chifley Skate Park is now open. Thanks to everybody who participated in this consultation. Your feedback has helped us design and build a great facility for local skaters. We hope you like it. Randwick City Council is building a new $700,000 skate park in Chifley Reserve, off Bunnerong Road. As a result of the community consultations, the original plans were modified to better reflect the needs of skaters. To help design the new skate park, Council set up an advisory group of local experienced skaters, skate park design specialists and Council landscape designers. This group developed the design for this exciting new facility.The skate park will include a pump hump, euro gap, hubbas, grind rails, a boomerang bowl, taco, transitions, and a wedge bank with hubas. The designs have been presented at the local precinct committees meetings at La Perouse and Matraville. The design includes shelter and weather screening, seating and landscaping with native plants. The simple robust modular shade structure and laser cut steel screening walls will now use skate silhouette images. See the artist perspectives and have a look at rhe indicative drawings and plans for further information. The inclusion of a skate park in Chifley Reserve was an outcome of the community consultations undertaken in development of the Chifley Reserve Plan of Management. You are invited to Ask questions of Council about the plans up to 15 September 2014. Thank you to everyone who asked a question. We will be responding to the final questions over the next fortnight. The skate park was designed and constructed in close consultation with the community and under the advice of professional skaters. The skate park is the second skate facility in Randwick City with another located at Maroubra Beach. Hundreds of local skaters packed the skate park on opening day where there were free activities, a skate demonstration and food. Mayor Noel D’Souza says he is pleased to be investing in the future of the local area and providing a high quality facility for the families and youth of the south. “Skate parks are meeting and socialising places for young people. They are used by children and young adults of all ages and provide a healthy recreational activity. “I’m very proud to be investing in the future of our area and pleased to see Chifley Sports Reserve continue its transformation into a high quality recreational facility. “We are currently building two amenities buildings at the park and in 2016 we will start construction on the first all-abilities playground in Randwick catering specifically to the needs of children with disabilities. “I hope the skate park will be a much loved facility by the community for decades to come,” said The Mayor. Construction of the skate park started in May 2015 and is due to be finished by September, weather permitting. Major earthworks are complete and construction is under way on the skate bowl area. Concrete has been poured for the seating wall and hardstand area on top of the skate bowl. The new $700,000 skate park in Chifley Reserve is between the new car park and Bunnerong Road at the northern end of Chifley Reserve. As a result of the community consultations, the original plans were modified to include a street skate area. The artist perspectives and concept plans on this site were used during the community consultations. These changes have been included in the construction technical construction drawings. The inclusion of a skate park in Chifley Reserve was the result of extensive community consultations in developing the Chifley Reserve Plan of Management. The skate park plans amended in response to community suggestions. Skate Park is now open! The Chifley Skate Park was officially opened on 17 December 2015 by Randwick Mayor Noel D'Souza.